Now that the recent series of articles on the ‘Presuppositions of NLP‘ is complete, here’s an exercise that you can try at home, to really understand how relevant these presuppositions are to your life. Pick three of these NLP presuppositions. They could be ones that particularly resonate with you, or you could just pick any three at random. Now think of some challenge that you have – it could be at work or at home, it could be something that holds you back or more about how you are going to learn something or reach a particular target. And, by the way, if you don’t have any challenges in your life, maybe you’re not setting your sights high enough. Take the first of the presuppositions and use it as a lens to look at the issue. What’s different about the issue when you look at it from the viewpoint of this presupposition? What options does it open up? What does it make sense to do in the light of the presupposition? Now repeat this exercise with the other two presuppositions. Notice what insights and learnings you get. The chances are that some of the insights you get will be more useful than others… so which insights are most useful to you? And what are you going to do differently as a result what you’ve learned? This is a great exercise Andy. Thanks for sharing. 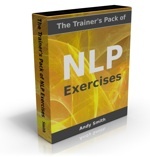 I'm going to start this with my favourite NLP presupposition 'there is no failure, only feedback'. Thanks for pointing this out Chris – I think I missed updating these links when I split this NLP blog off from my Coaching Leaders blog. I’ve corrected the link to the list of NLP presuppositions in the article.